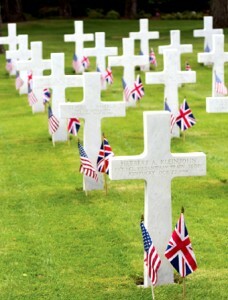 THE hushed grounds of Brookwood Cemetery provided the setting for a poignant American Memorial Day service on Sunday. Representatives from the British, French and American Armed Forces convened in Brookwood over the weekend to pay tribute to all those who have lost their lives representing the ‘stars and stripes’ during combat. Many veterans – including 91-year-old Lewis Trinder, who served in the Royal Navy on HMS Fleetwood, then HMS Magpie in the Battle of the Atlantic, and later, on the Arctic Convoys. Lewis spent some time rubbing shoulders with the current crop of military personnel, both from home and away. Orchestrated by Master of Ceremonies – the Regent of the St James Chapter of The Daughters of the American Revolution, Laura Taylor – the moving day included prayers and the laying of wreaths. 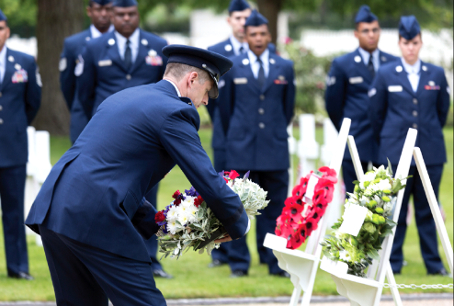 Chaplain Nick Farrell of the Initial Training Group (in Pirbright) addressed the sombre audience, as did Brigadier General Dieter E Bareihs, USAF; Chargé d’Affaires at the US Embassy in London, Elizabeth L Dibble; and Chaplain Lawrence Mulinda of the US Air Force. Particularly poignant was the moment when guests entered the war memorial itself to read the names etched into the wall of those who died while in active service.